On January 23, the Trump White House recognized unknown Venezuelan opposition leader Juan Guaidó as that country’s President in a blatant attempt to end the Bolivarian Revolution under the leadership of the democratically elected President of Venezuela, Nicolas Maduro. 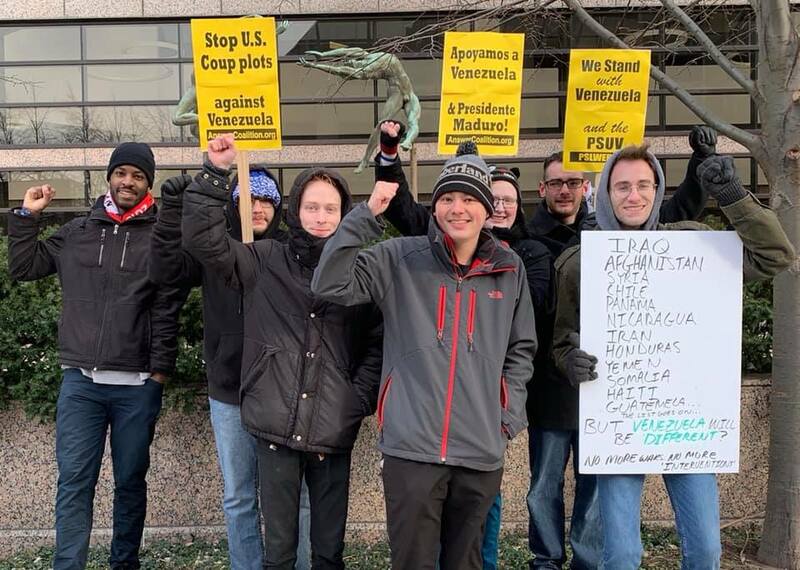 That same day through the end of the week, progressives around the world rallied to the defense of Venezuela against the attempted CIA-backed coup. Apoyamos al presidente legítimo constitucional, Nicolás Maduro Moros, y la Revolución Bolivariana. Rechazamos el golpe de estado contra Venezuela, orquestado por la Casa Blanca de Trump, Mike Pence, y la CIA. We support the legitimate, constitutional president, Nicolas Maduro Moros, and the Bolivarian Revolution. We reject the coup d’état against Venezuela, orchestrated by the Trump White House, Mike Pence, and the CIA. Next Next post: Demand Justice for Eleanor Northington!